RIP Admission to the "Night Full of Fear" Halloween event at The Shannon on Saturday October 26, 2019. It can't be considered a successful Halloween unless you experience real fright. The annual "Night Full of Fear" event is sure to attract the scariest goblins and the spookiest demons. What better place than The Shannon to host such an event? An established icon in the Hoboken community - The Shannon has been bringing astounding holiday events for decades. Known in town to be a safe bet for a good time, we are once again hosting an epic HalloWeekend event that will surely be spoken about for weeks to come. When the light from the sun falls in the evening sky, Hoboken party goers will scour the streets in search of the best fright in town. Rest assured, The Shannon will bring it's usual bonanza. 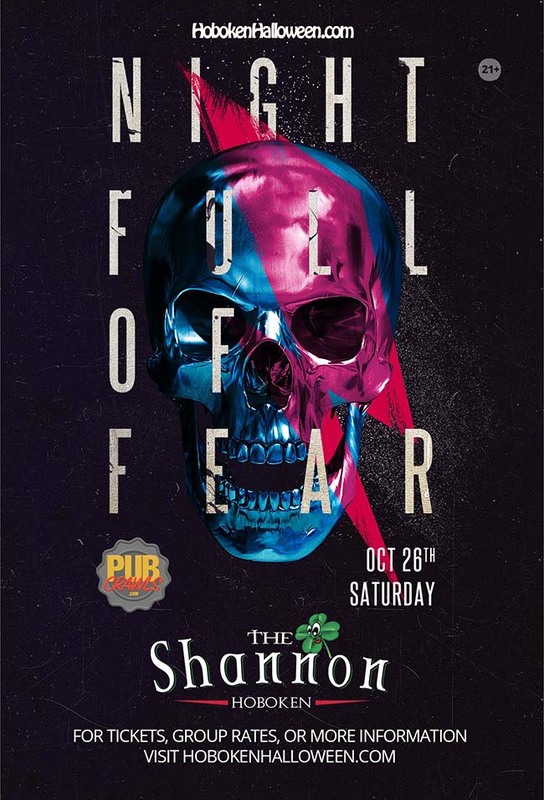 Join the festivities taking place this year at The Shannon for Halloween and dress accordingly. Walking down 1st Street may be scary, but if you're up for it, we are glad to welcome you to the house of horror.